On the first day high schoolers returned to Red Cloud for the school year, new principal Clare Huerter was beaming. She’d been waiting all summer to see the students again. Although this is her first year as principal, Clare is a familiar face at Red Cloud. This year is Clare’s fifth at the high school, where she most recently served as dean of students. A graduate from Creighton University in her hometown of Omaha, Clare first came to Red Cloud as a volunteer through the Magis Catholic Teacher Corps. Clare immersed herself in the life of a Red Cloud volunteer, teaching freshman English, driving a bus route, and sponsoring the school’s hackey sack club. When she reached the third year of her program and Magis required her to take an internship, Clare initially feared that she would have to leave Red Cloud. Instead, she landed an internship with the high school dean of students and principal, setting her up to fill one role and then the other in the following two years. Clare credits her history of serving in multiple positions at Red Cloud with her ability to understand the lives and perspectives of the high school’s staff. “I’ve driven bus, I’ve been a volunteer, I’ve lived in [the volunteer] community. Last year I also lived in Rushville, Nebraska, which is 30 miles south of here, so I also know what it’s like to be a commuter. I know what it’s like to be Magis,” Clare says. “So I can understand how stressful it can be when it’s snowing out and we have school and how stressful it can be to arrive to school after driving 30 miles or 60 miles to school in terrible weather and then coming and having to teach all day or driving a bus for an hour in that kind of weather coming and teaching for a full day. “Already having the trust of the students and the trust of the staff,” as Clare puts it, doesn’t hurt. Neither does having the help of assistant principal Alex Mackey, a newcomer to Red Cloud, with whom Clare already has a rapport. Like Clare, Alex has worked on Pine Ridge Reservation five years now. Originally from Orlando, Alex moved to Dallas while in high school before attending the University of Texas at Austin. At the start of his senior year in Austin, Alex applied for Teach for America and the Peace Corps. His decision to pursue the former brought him to the Reservation, where he taught English at Little Wound School. During his last two years in TFA, Alex worked towards earning a degree in administration from Oglala Lakota College. After obtaining his degree, Alex set out to find a place where he could put his certification to good use. He landed on Red Cloud, which he was drawn to because of its record of preparing students for college. Alex isn’t the only fresh face in Red Cloud’s administration. Visitors to the Mackert Memorial Grade School building quickly realize that new principal Juliana (White Bull) Taken Alive has set up shop in the office once held by assistant principal Ann-Marie Amiotte. “People come in and say ‘where’s Ann-Marie’s desk?’ People walk in all the time, ‘Where’s Ann-Marie?’” Juliana laughs. In fact, Ann-Marie’s office has moved to the middle school building. The precedent-defying switch — in the past, principals have kept their office in the middle school — was intended as a reminder that the elementary principal oversees grades K-4 as well as grades 5-8. “That’s the goal and that’s the charge for both of us is to be present for both buildings and not to just be married to the one building,” Juliana says. 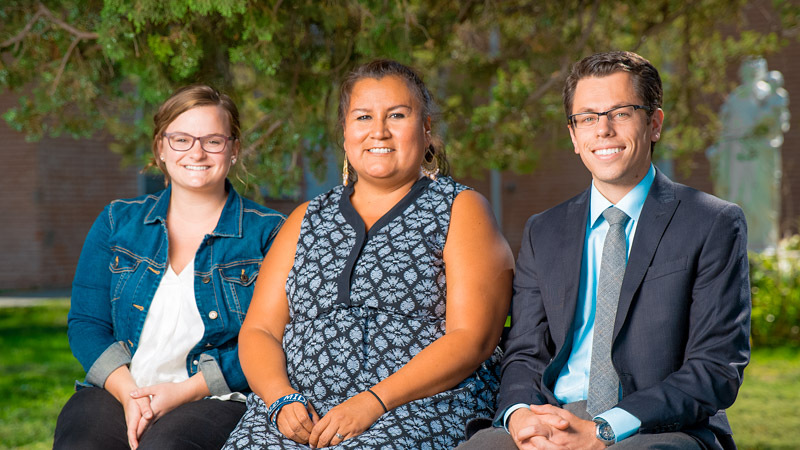 Juliana is originally from Standing Rock, where she recently finished her term as the president of the McLaughlin school board which she served on for three years. She comes to Red Cloud extremely well qualified with 14 years of K-8 classroom experience in addition to 5 years of educational leadership roles and nearly twenty years in total working in Native Education. In her previous position as Manager of Teacher Leadership Development for Teach for America South Dakota, Juliana saw teachers visit “excellent” schools in Denver and Minneapolis to try to learn from their success. But Juliana knows that you don’t have to leave South Dakota to receive an excellent education. When Juliana was growing up on Standing Rock, a number of her friends came down to Pine Ridge to study at Red Cloud. 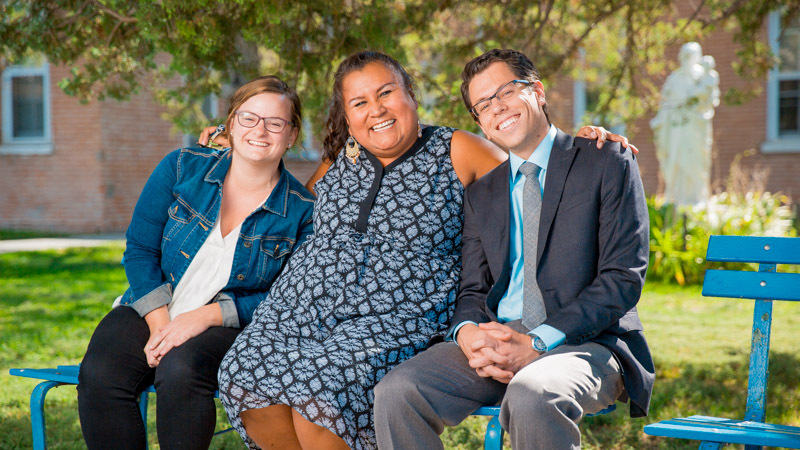 Those friends, Juliana says, “went on to do some really great things.” So when the principal position opened up, Juliana was intrigued, especially when she found out her two school-aged children could attend Red Cloud. Family is important to Juliana, who has five children with her husband of 25 years (her three oldest attend Sitting Bull College in Fort Yates, ND). While this has made it harder for her to leave Standing Rock, it’s driven her to make the all-important connections with the families of her students. “A goal of mine is to network within the communities so I know parents [and] families,” she says.